Very interesting post, as always. You may add another air defence asset to the Kaliningrad order of battle. The 43d SAM brigade, garrisoned in Znamensk and equipped with S-300V, would be an important contribution to the air defence of Kaliningrad. 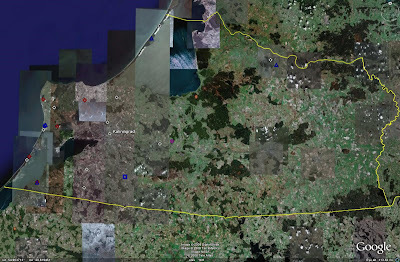 Unfortunately, Znamensk (54°36'38"N 21°13'22"E) is still in low resolution. I think the only places you can actually see S-300V components are Birobidzhan, Orenberg, Smolensk, and Strugi Krasnyye. S-300Vs in Kaliningrad are a great ATBM asset but they don't really add anything that significant to the picture, especially once the S-400 moves in to take over the place. Curious about one thing ...when you draw circles of radar or missile coverage - what target height is assumed? I'm simply using the maximum quoted ranges for the system. Most modern systems are capable of target detection or engagement at relatively low altitude even at their max range anyway, provided you don't get into a line of sight issue with the Earth's curvature. For example, when mounted at sea level, BIG BIRD's radar horizon at 300 kilometers is 5292 meters. At some point I will generate an example of an actual engagement envelope diagram for a SAM system and explain how to figure out where and when targets can actually be engaged. If you look at the Chinese Air Defense piece from I think January, I do describe how terrain can significantly impact the range and field of view of a SAM system. 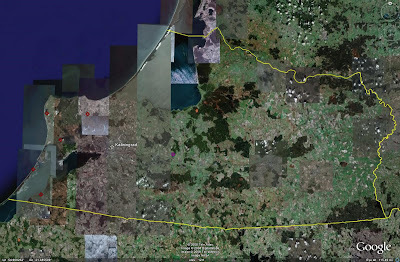 But, if I tried to generate rings demonstrating a wholly accurate terrain picture, I'd get nowhere. It'd take way too much time. The bottom line is that while the rings aren't truly 100% accurate, they are as accurate as necessary for most applications seeing as how the system does in fact have a capability at that range. on ge? there seems to be no such mark. I think there are nont only new radar system (BIG BIRD, THIN SHIELD etc.). We can see on the pictures aslo old russian radars: K-66, P-37 and many high finders. 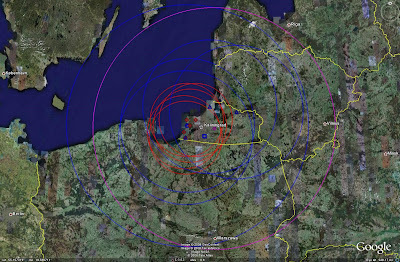 This Russian air defense network in Kaliningrad is now defenseless against any NATO air strike. 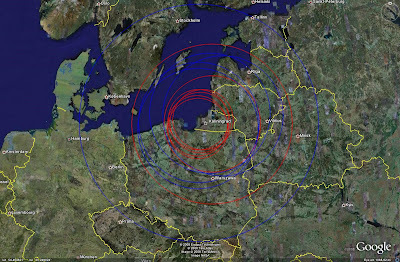 One stealth cruise missile salvo (JSOW-ER, JASSM, Taurus, SCALP) could destroy it and/or important targets in Kaliningrad Oblast very easily not mention about S-300PS vulnerability to modern jamming. 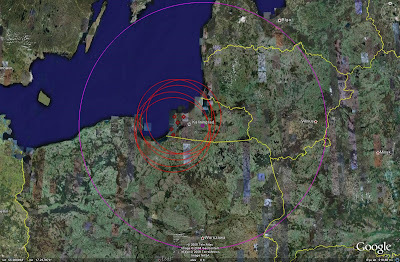 Why are not there any Clam Shell low-altitude detection radars present in the Kaliningrad Oblast? There are CLAM SHELL radars present, but they are not marked separately as they are co-located with the S-300PS batteries. Yet, could you explain to me difference between CLAM SHELL and TIN SHIELD radars? I guess both are battery level acquisition radars but first of them detects only low level targets and the latter medium and high altitude threats. Moreover at battalion level there is longer range BIG BIRD acquisition (EW) radar present. So I think S-300P battalion can work without TIN SHIELD radars active while FLAP LID engagement radars get target information from CLAM SHELL (low-level coverage) and BIG BIRD (higher level awareness). Besides analyzing your post about S-300P deployment sites I could not find TIN SHIELD radars in Russia. Does it mean this radar type was withdrawn from service now or it is not a part of more modern S-300P versions i.e. S-300PM and above? CLAM SHELL is a dedicated low-altitude detection system. It has a height limit of about 10,000 meters if I remember right. TIN SHIELD is used to supplement the EW coverage of the system and allow it to operate independently of the BIG BIRD radar set. TIN SHIELD and CLAM SHELL are both extra features, they are not needed for normal system operation. China does use the TIN SHIELD with its S-300PMU-1 systems, so they are still used with the more modern variants. Russia doesn't appear to use them that often with their S-300P batteries, but that's probably due to the large number of EW assets present in the nation anyway. If you look in the SAM site file, you will see that Russia uses a lot of TIN SHIELD radars as EW assets throughout the nation. - TIN SHIELD radar is not S-300P organic component but primarily an independent EW radar system which an be used alone. - S-300P system can work fine only with two radars: BIG BIRD (acquisition) and FLAP LID (tracking and engagement). However, is it possible to detect and track targets independently by FLAP LID radar? 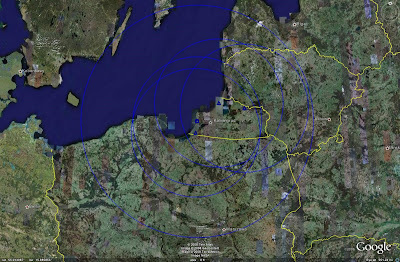 Maybe this is also sector search radar similar in concept to 9S19 HIGH SCREEN radar from S-300V system? FLAP LID does have an autonomous search capacity to allow it to perform independently. HIGH SCREEN is a pure sector scan radar, not an engagement radar! For more info on how the S-300P components relate and interact, check out the S-300P analysis feature from July of this year. Yes, FLAP LID can detect targets autonomously but with such very narrow detection angle in elevation it can do that effectively only at high altitudes. Having read your S-300P article I noticed you forgot to mention about S-300P missiles with nuclear (5V55S/V, 5Zh48) and passive radar homing warheads (5V55VM/PM). I think both are very important S-300P features!